Jason P. Fields, D.M.D. & Monique R. Yuan, D.M.D. First and foremost, we would like to welcome you to our practice. We believe people should have their own healthy teeth for an entire lifetime and we look forward to helping you achieve this goal. Your experience starts when you call our office and speak with Patty to set up a consultation appointment. At this appointment you will provide our office with your up-to-date medical history and any history related to your tooth. Dr. Fields or Dr. Yuan will meet with you to discuss and review your history as well as diagnose the source of your problem. Then, the doctor will explain and recommend necessary treatment. At your treatment appointment, expect to be well-taken care of. Maribel and Anna are here to make the root canal procedure as comfortable as possible for you while they assist the doctors. Please plan on the root canal therapy taking about 1 hour to 1 hour and a half. At the end of your visit, Dr. Fields or Dr. Yuan will review post-operative instructions with you and go over any prescribed medications. A final report with the doctors notes and the radiographic xrays will be sent to your restorative dentist. So our goal is to help you achieve and maintain a healthy mouth! 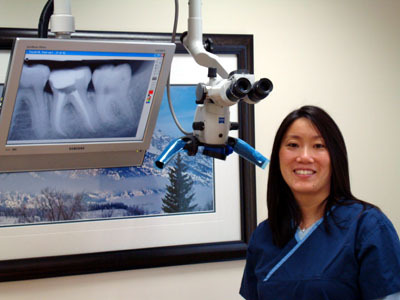 We pride ourselves on our up-to-date technology to help us provide the best endodontic experience for our patients. We are a 'paperless' office and are pleased to offer you the opportunity to complete your "paperwork" online at our website. You simply call to speak with Patty and schedule your appointment. Patty will then be able to give you your own user ID and password to sign on to our website. Here you can complete your medical history, pain history, and office forms, HIPAA and endodontic treatment consent. During your visit to our office you will also experience the latest procedure technology. We are equiped with digital radiography, dental computer software, ASI dental carts, rotary instrumentation and microscopes to enhance our light source and visibility of your tooth's anatomy.